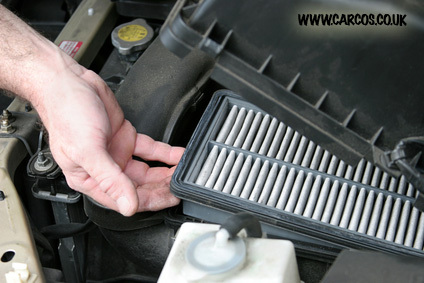 Air filters can have a noticeable impact on your vehicles performance and fuel efficiency. Some of the easiest changes to make to the way your vehicle performs are making sure your tyres are properly inflated and your air filter is clean and allowing enough air to get into your engine while still filtering out foreign objects and dirt from your engine. By the end of this article you’ll be confident in how to change an air filter so you can do it yourself with a minimal out of pocket expense. It’s such a simple procedure that it would be silly to take your vehicle to a garage to get your air filter changed. To start out, you’ll want to make sure your vehicle is off, cool to the touch, and in park. Open your bonnet and safely prop it up with your safety support bar. Once secured, locate the air filter housing. This is usually a somewhat large black square/rectangular shaped container. Check the size of your new air filter against the housing, the sizes should be fairly similar and will help you to quickly locate the housing. It will also have a large intake house connected to it if you’re having trouble locating the housing. Once located, remove the housing. Usually there will be screws holding it in place; if so, use the appropriate screwdriver to remove the housing making sure to set the screws aside in a safe place so you don’t lose them. Some vehicles may have clamps holding the air filter housing in place, in which case you need to loosen the clamps and remove the housing top that way. If you’re confused you may always resort to checking your service manual for the appropriate way for your specific vehicle, however, it should be a simple task. Once the housing top is removed you’ll want to make sure no dirt or debris will fall into the air intake once you remove the old filter. Remove the old air filter by lifting it straight out of the housing; there shouldn’t be any resistance or snagging in the process. You may toss or recycle the old air filter as you cannot reuse them once they’re worn and dirty. Carefully wipe down the housing and seal of the air intake prior to installing the new filter. This will make sure you’re getting the most performance out of your new air filter as well as preventing any debris from getting directly into your intake (as that’s what the filter is for in the first place!). Making sure the seal is clean and free of dirt, dust and cracks ensures a better seal and lets your intake perform as intended. Once the area is clean and the old air filter is out, remove the new one from it’s packaging and place it in the housing in the same fashion the old one was. Again there shouldn’t be any resistance or snagging while fitting it in, but the fit should be snug and feel like it was intended to fit in to that slot. At this point you’re almost done! You’ll just need to replace the housing top and either screw it back in snugly or clamp it in place depending on the vehicle. Double check everything is securely in place and there aren’t any visible openings in the seal between the top and the housing as well as the housing doesn’t move in place if you try and wiggle it about. Close your bonnet and start the vehicle. Take it for a quick drive around the block and listen for any strange noises that could be caused by the air filter being improperly installed. More likely than not, you’re all set and have successfully installed a new air filter! If you enjoyed our guide on how to change an air filter, be sure to check out Car Cosmetic’s other vehicle maintenance tips and guides!